Be the first to share your favorite memory, photo or story of Lynda Lou. This memorial page is dedicated for family, friends and future generations to celebrate the life of their loved one. 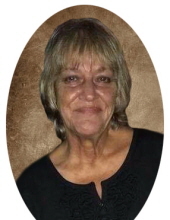 Lynda Lou Hamm Bates, age 64, of Flemingsburg Road, Morehead, passed away Saturday, February 9, 2019, at St. Claire HealthCare in Morehead. Born May 15, 1954, in Rowan County, she was the daughter of the late Oscar Levi Weldon Hamm and Virginia McKenzie Hamm. In addition to her parents, she was preceded in death by two sisters, Geneva Hamm and Dorothy Vanlandingham, and three brothers, Arnold, Howard, and Charles Hamm. Lynda is survived by one daughter, Pepper Slone (Joe); five grandchildren, Nikki Sexton (Elijah), Chelcee Slone, and Dawson Slone, all of Morehead, Tylor Fraley of Oregon, and Caleb Slone of Lexington; two great grandchildren, Abram Sexton and Gabby Sexton; and Pepper’s special fathers, Billy Bates and Delford Fraley. Other survivors include three sisters, Eula Crisp (Kendall), Betty Day (Phil), Beulah Holbrook, all of Morehead; two brothers, Oscar Hamm, Jr. (Sheila) of Nicholasville and David Hamm (Jennifer) of Owingsville; numerous nieces and nephews; and other extended family and friends. Lynda was a former supervisor for Community Alternatives of Kentucky. She loved reading, being outside, fishing, walking, and spending time with family. Her most treasured moments were teaching her grandchildren to cook holiday meals. Funeral services will be conducted 11 a.m. Tuesday, February 12, 2019, at Sharkey Baptist Church with Pastor Harley Sexton, Jr., Pastor Elijah Sexton, and Pastor Robert Kidd officiating. Burial will follow in Forest Lawn Memorial Gardens. Pallbearers: Ernest Holbrook, Phil Day, Jr., Brandon Ferrell, Joe Fraley, Jamey Dixon, and James Holbrook. Visitation is 5 p.m. to 8 p.m. Monday, February 11, 2019, at Sharkey Baptist Church, 2555 Sharkey Road, Morehead, KY 40351. To send flowers or a remembrance gift to the family of Lynda Lou Hamm Bates, please visit our Tribute Store. "Email Address" would like to share the life celebration of Lynda Lou Hamm Bates. Click on the "link" to go to share a favorite memory or leave a condolence message for the family.